Tynedale fixture at the Downhills course near Corbridge on Sunday. It has attracted a total of 107 entries on a seven race card which starts at 12.30pm. and 7 entries in both divisions of the 148cm and under contests over six furlongs. The opening South Northumberland Hunts Club Members has 7 entries, however the race conditions do not favour Annie Aces, 2013 scorer, Cast Iron Casey or Rennington Blue, who all have to carry a 14lb penalty. Border Flora chased home Coastley in the 2014 renewal and, at the weights, has every chance of going one better. The other one to consider is winning chaser, Fozy Moss (right), who shaped well on his first run for eleven months at Alnwick. In the four, five, six and seven year olds Open Maiden Race, the pick of the Northern Area entries are Afterclass, Chandos, Senate Law and Whatsthestoryman. Of the others, Yorkshire raiders, Anddante, Banderitos and Shannon Silver warrant respect. Kit Alexander's mount, Afterclass has been placed on all three starts at Alnwick and must go close again, while the improving Senate Law (left) found only King Of The Dark too good on his reappearance at Alnwick. The NPPA Club Members Race has 24 entries and promises to be one of the most competitive contests of the season, with the list including Nickwillis (unbeaten in 2 outings in 2014), Victor Thompson's recent dual scorer, Stoney (right), The Brig At Ayr, Lowanbehold, Sea Scout, Instant Shot, Keeverfield and Tipsy Dara, the latter pair are also entered in the Ladies Open. However, Gavin Hamilton's exciting new recruit, Wayupinthesky, who has an Irish Point rating of 108, might be the one they all have to beat if reproducing the form which saw him land a Boulta Winner of Two contest by a head under Derek O'Connor on 14 December 2014 before finishing three and a half lengths 2nd to the highly regarded Two Rockers in the Killeagh Open less than six weeks ago. Beggar's Velvet was followed home by Radharc Na Mara, Sharivarry and Soul Angel (left) at Alnwick last time and the quartet are all set to cross swords again on identical terms in the Ladies Open Race over three miles and five furlongs. Begger's Velvet stayed on strongly that day under a great ride from Rachael McDonald and, with no stamina issues, is fancied to strike gold again. The Men's Open Race for the William Bell Memorial Gold Cup is also run over the extended trip of three miles and five furlongs and can go to proven stayer, Gunner Jack (right). He relishes Corbridge's stiff uphill finish and is bidding for a fourth success in the contest after landing the spoils in 2011, 2012 and 2013. Last year's winner, Indian Print finished seventh on his belated seasonal debut at Mordon last week but should come on a lot for the run. Ex-chaser, Camden sprang a 20/1 surprise in the recent Sinnington Mixed Open but may stay closer to home for an alternative assignment at Brocklesby Park. Southern raider, Schindler's Prince, another one who excels over marathon trips, is also entered at Cocklebarrow. The aforementioned Wayupinthesky will also be a leading player if opting for this race instead of the NPPA Club Members. The Restricted Race has 18 entries and should be another competitive affair. Bella Grappa scored on his debut at Alnwick in December 2013 and is sure to have been primed for his reappearance by trainer, Susan Grant. Chanceofa Lifetime is open to improvement after finishing twelve lengths 4th to Bafana Choice in a fast time at Alnwick. King Of The Dark had a bit in hand when opening his account from Senate Law and Afterclass in the recent Percy Maiden and has the scope to follow up. Oscar Stanley (left) ran a blinder when finishing a close 3rd to Crazy Diamond at Friars Haugh in January, while Seeyouincourt was an easy winner of a Tallanstown Maiden on his last start in April 2014. 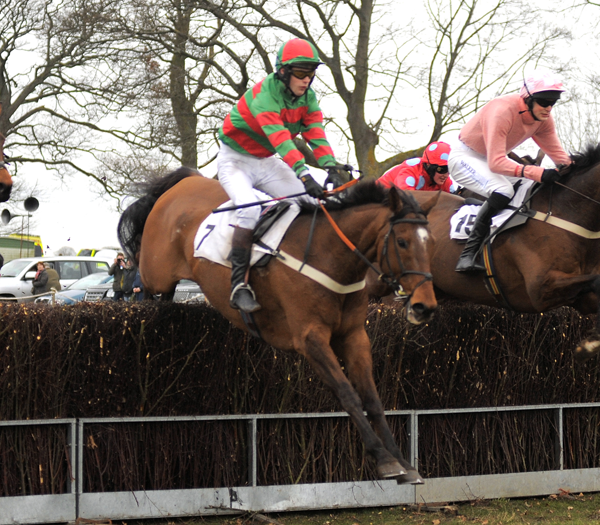 The concluding Open Maiden Race for eight year olds and over can go to The Gotfor Man (right). Clive Storey's charge finished runner-up in two of his four starts last term and was prominent when brought down four out on his reappearance in the Jedforest Maiden. He faces a maximum of ten rivals with the main threat likely to come from Pampanito and Heckley Herbert. The former was lying 4th when falling two out at Sheriff Hutton and ran creditably when fifth in a Thorpe Lodge Restricted next time. Heckley Herbert was just outbattled on the run-in by Oscar Flyer at Mordon and another big run is anticipated if he has recovered from last Sunday's exertions. The course is situated 3 miles north of Corbridge, with access off the B6318 and a separate exit road to the A68. For SatNav users, the post code is NE45 5QD.